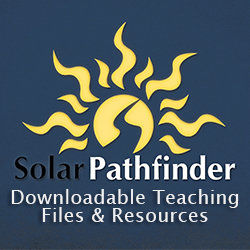 These teaching files have a short, animated video demonstration of the parts, set-up, and use of the SolarPathfinder, and demo reports created in the SolarPathfinder Software. Also included are teaching files (pictures of a Pathfinder site reflection and corresponding diagram tracing, etc.) for use in Powerpoint presentations, overhead projectors, or hand-outs.